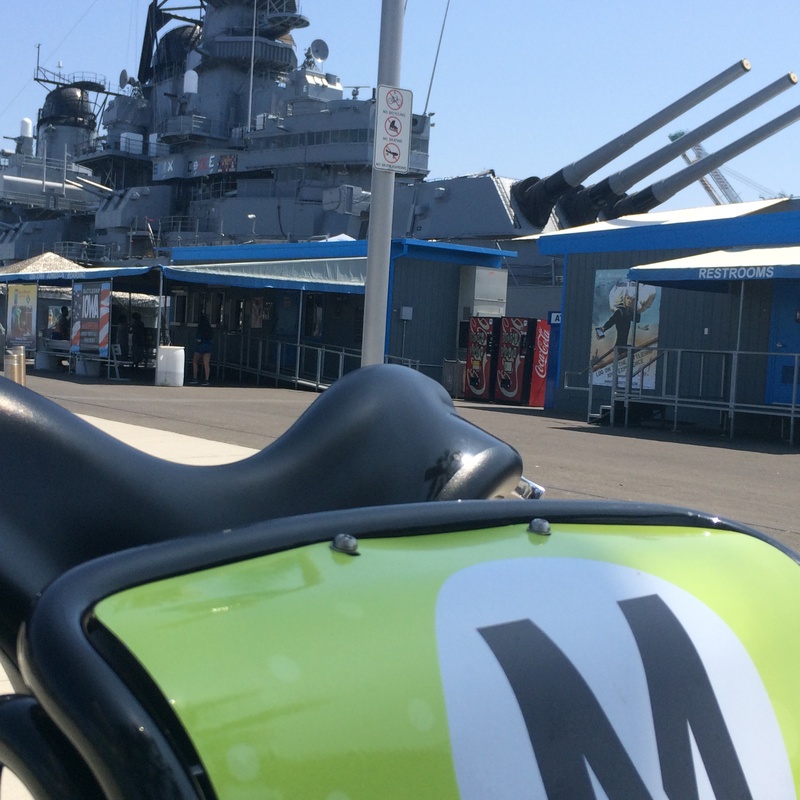 Metro Bike Share opened at the Port of L.A. this morning. Photos by Joe Linton/Streetsblog L.A. This morning, Metro and Port of L.A. leadership celebrated the opening of the newest expansion of Metro Bike Share: the Port of Los Angeles. According to Metro press materials, there are 120 bikes at 13 docking stations. 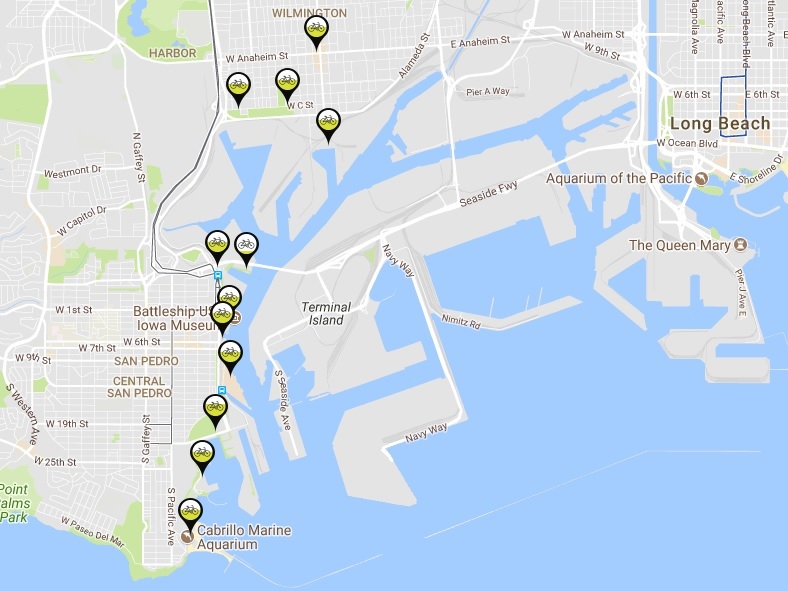 Current maps show eight docking stations in San Pedro and four in Wilmington. 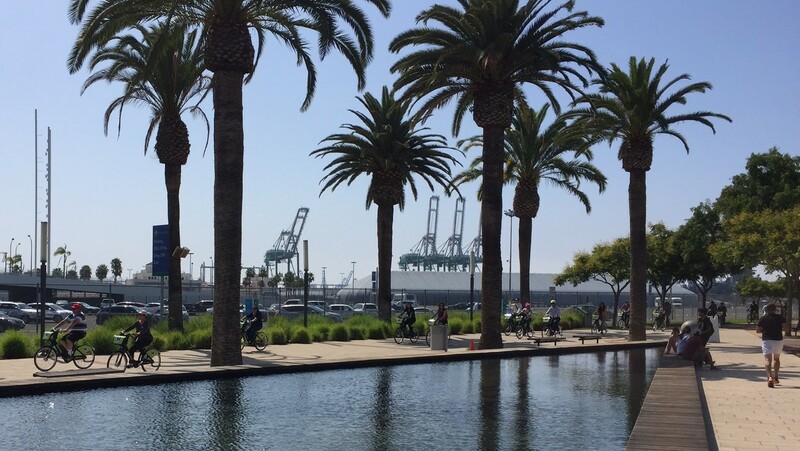 Though any bike-share system can open up new transportation options for people, the Port system faces some potential challenges. Even Metro staff characterize the port expansion as an “interesting pilot” of a tourist-driven portion of their overall bike-share system. Generally though, the Port of L.A. expansion represents Metro expanding bike-share where funding was available, more than where ridership appears most likely. 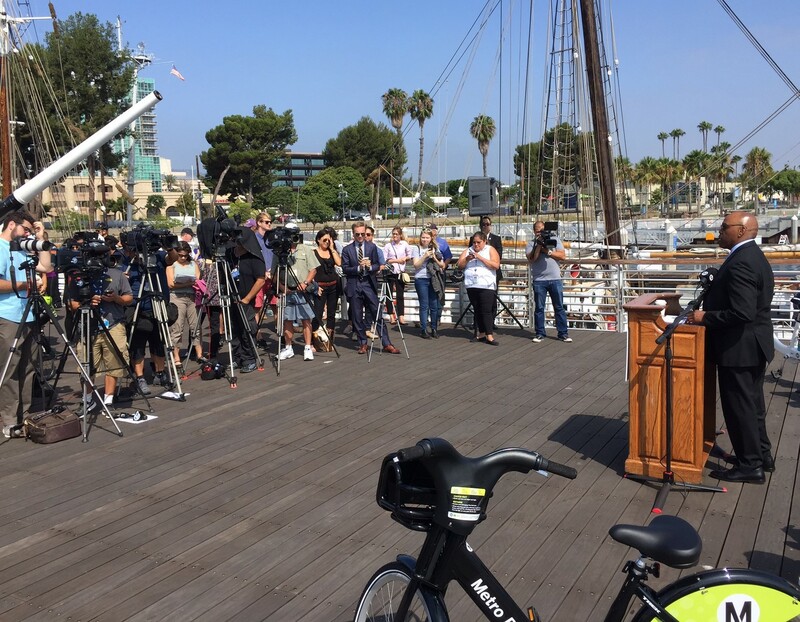 At this morning’s kick-off event, officials emphasized the importance of these bikes for visitors who want to experience multiple sites at the Port without having to drive and park to travel between them. 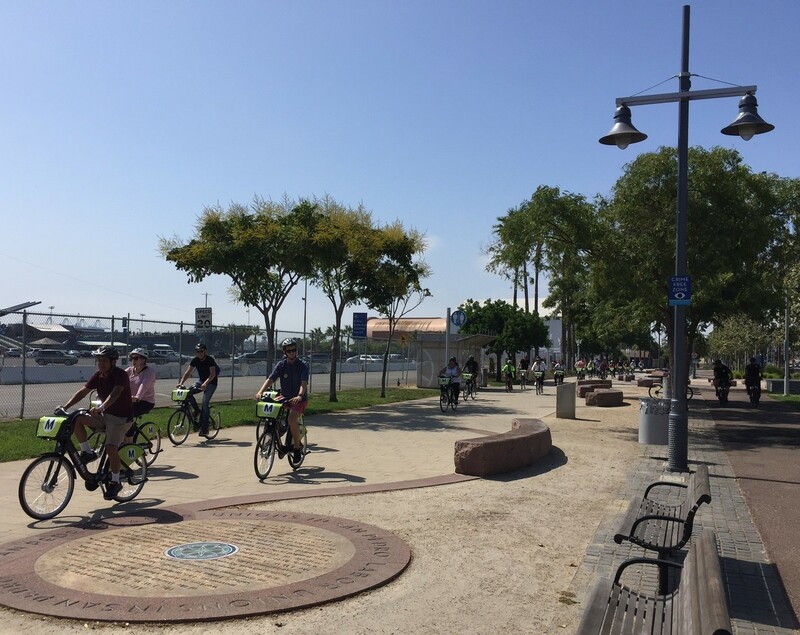 Port of Los Angeles funding rules limited placement of docking stations to sites operated by the Port, so the bikes are available at various waterfront locations including Ports O’ Call Village, the L.A. Maritime Museum, the Catalina Express terminal, and Wilmington Waterfront Park. For the initial phase, only two stations are planned in adjacent inland areas: one each in Wilmington (open at the intersection of Anaheim Street and Avalon Boulevard) and Downtown San Pedro (pending). Given that bike-share operates with trips starting and ending at a docking station, bike-share works best in clusters or “blobs.” The port bikes are effectively unreachable from the downtown L.A. and Pasadena clusters. Even the Wilmington and San Pedro clusters are nearly three miles apart from each other. The connection between them is along industrial and truck-heavy John S. Gibson Boulevard, which has bike lanes, but is decidedly not any kind of scenic coastal route. Hence these new Port bike-share service areas will likely operate as the Metro Bike Share system’s two smallest and most isolated clusters. 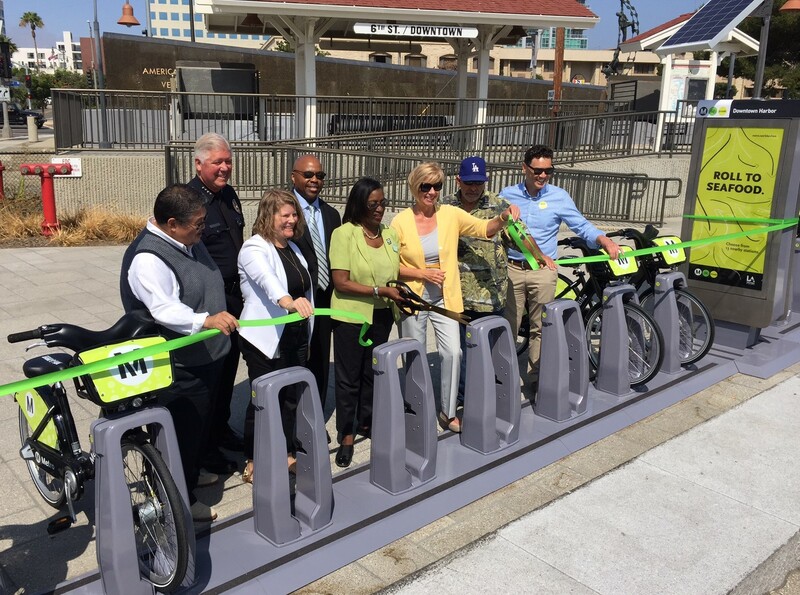 The San Pedro and Wilmington docking stations represent the first Metro Bike Share expansion into areas not served by frequent Metro Rail. To date, Metro Bike Share’s strength has been its relatively strong integration with transit. This morning, Metro CEO Phil Washington touted the bike-share system’s proximity to the Metro Silver Line Bus Rapid Transit, as well as bus lines 205 and 246. 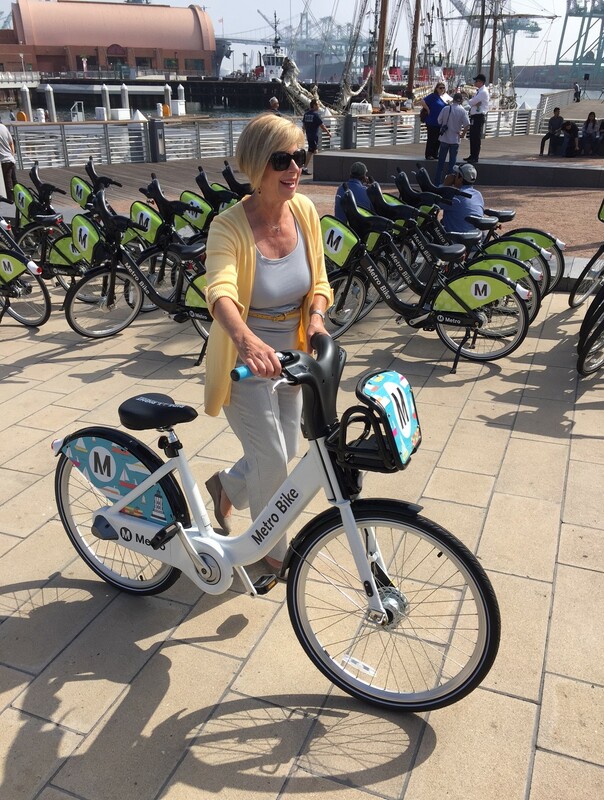 County Supervisor and Metro Boardmember Janice Hahn mentioned that she had not bicycled in a while, but nonetheless led the inaugural ride. These systems may work better than expected. Bike-share is in its infancy; transportation systems need to start somewhere and can grow. The Port waterfront does attract tourists, who are likely to contribute a base level of usage. Funding has been approved for an initial six years. As times goes by, data should show where bike-share is making the most sense, and hopefully that data will inform future expansion. The new port bike-share system should get a boost when CicLAvia – San Pedro Meets Wilmington takes place next week. The popular walking and bicycling family festival will take place from 9 a.m. to 4 p.m. on seven miles of Harbor-area streets. 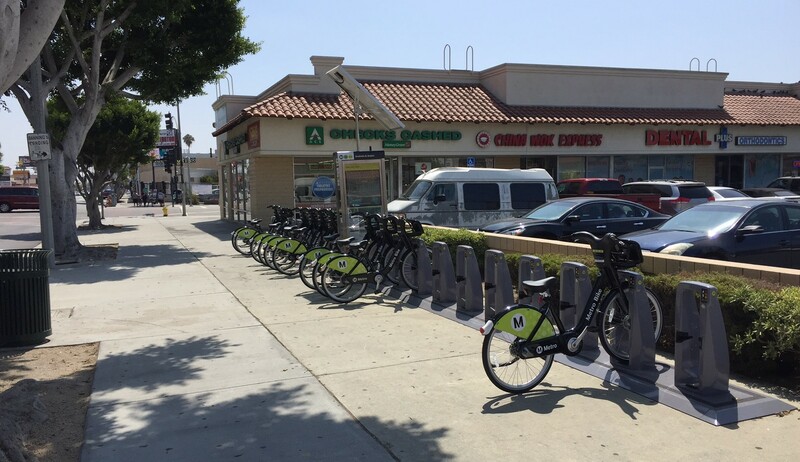 Metro Bike Share opened in Pasadena earlier this month. Venice expansion is expected to open in August or September. Once Venice’s system is open, Metro Bike Share is anticipated to have approximately 1,400 bikes at 125 stations.